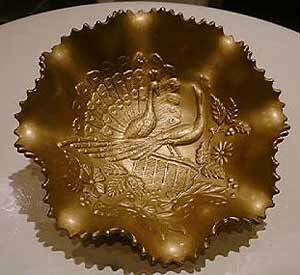 Unusual items turn up at Carnival Glass conventions and auctions. Here are a few that I've come across. 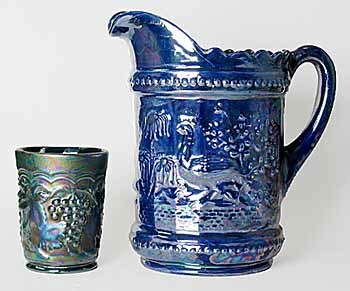 Above are an Imperial Grape tumbler and a Peacock at the Fountain Pitcher. What's unusual about them? They're not glass but ceramic. I've no idea why the tumbler was made, but the pitcher was reportedly made for a club convention. In 1980, Mount St. Helens in Washington state erupted, leveling more than 200 square miles of forest. 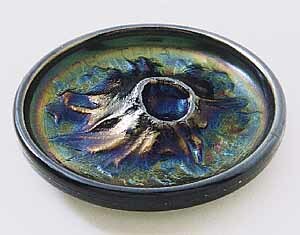 The iridized ashtray below is a souvenir commemorating the event and is made from volcanic ash. Shown are front and back. Courtesy of Randy and Joyce Stenbach. 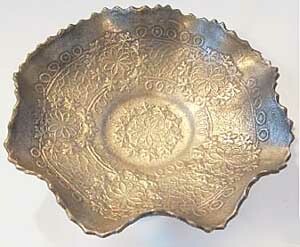 Below are several pieces in Carnival patterns but made of metal rather than glass. Why? It's been suggested that they were salesman's samples. That seems unlikely as they are much heavier than glass and there would be no way to show color or iridization. 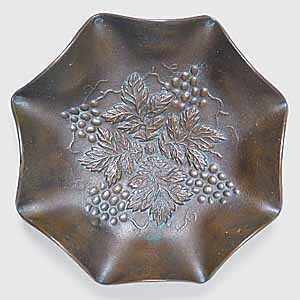 Such items are easy to make, as anyone who has taken a high-school foundry class knows. Perhaps just experiments. The Orange Tree bowl is courtesy of Richard Thompson, the Northwood Grape Leaves courtesy of Sylvester and Diann Walleck, and the Pansy courtesy of Wayne Anderson. 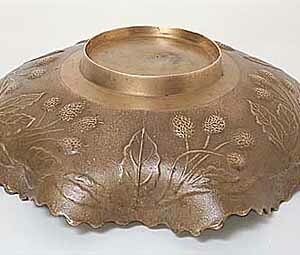 The Brass Leaf Chain bowl immediately above sold on eBay in April, 2004, for $350. Photo courtesy of Barbara Hobbs. 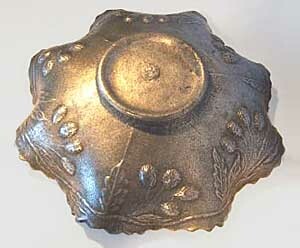 Above is a photo of a pot metal Big Fish bowl sent to me by Jim Boyd. 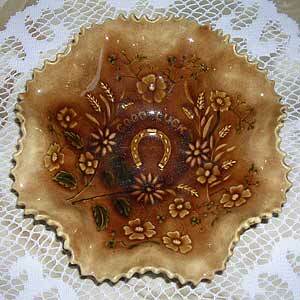 This is the first I've seen of these made of a Millersburg pattern. 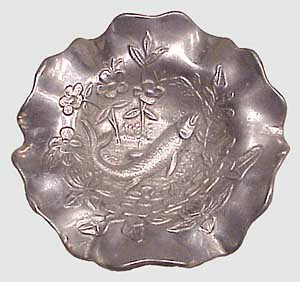 So far Fenton, Imperial, Northwood, and now Millersburg are represented in the list of makers for which patterns have been found in metal. 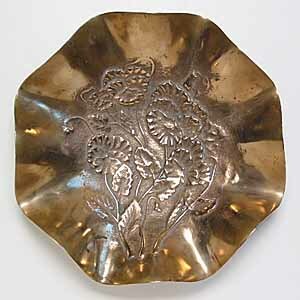 The Peacocks bowl in metal above sold on eBay (from England) in 2006. It brought $181. 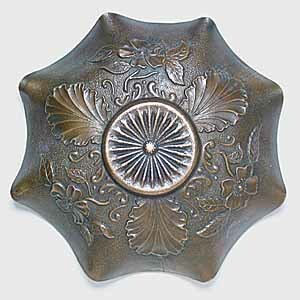 I can say I have never seen a carnival pattern in metal (I think they are neat) but do see a lot of the cheap ceramic pieces. Most often seen here (NE Ohio) are Imperial patterns: Pansy, Imperial's Grape, Tiger Lily, etc. 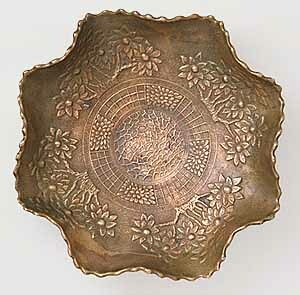 Also seen now and then are Northwood Good Luck and Fruits and Flowers bowls. 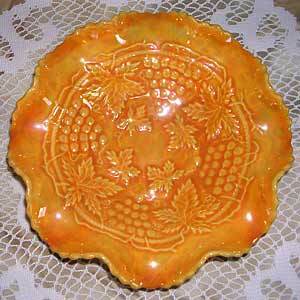 Have never seen any Fenton, Dugan, or Millersburg patterns. I once bought a white ceramic Imperial Grape punch set from a garage sale and the maker told me that this was something they made in ceramics class back in the 1960's. I asked how she got that pattern and she told me these were the molds the instructor was loaned to let them use (they had others in the Grape pattern). They are exact copies of their carnival glass ancestors. She was under the impression that the factory loaned out molds for ceramic classes, and that theory could hold true for the Imperial patterns which were in production in the 1960's. 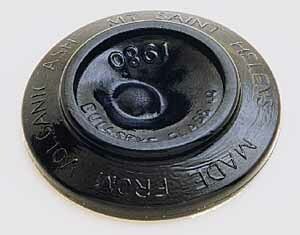 It would seem that the molds were not made from a piece of glass as the detail is generally good. 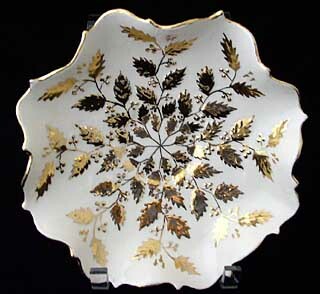 Prentiss Goodroad sent me this photo of a Fenton Holly bowl in ceramic with gold applied to the leaves and berries. 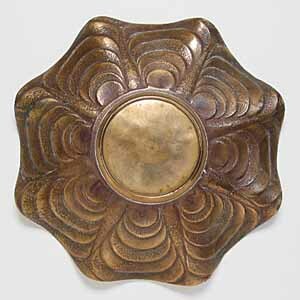 The pattern is sharp and the gold application looks professionally done, so it seems unlikely it's a one-off piece. Wonder if Fenton at one time considered going into pottery? Don and Lorinda Cearing sent me these photos of their ceramic Good Luck and Grape and Cable ruffled bowls.